UPDATE (9/6/2017) : I'm back to the keezer after moving into a new house. The build process was exactly the same as the previous ones, except I went with a digital temp controller on this one. I added the link to that on the parts list below in case you're interested. I prefer the digital version to the analog, but both work very well overall. I've added a few pictures of the build below. 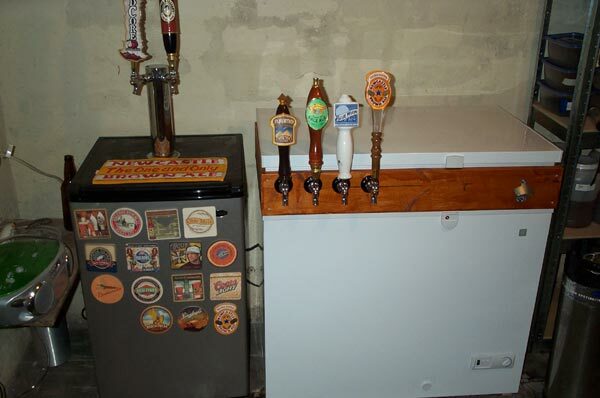 UPDATE (5/14/2015) : Sold the Keezer to a fellow homebrewer, so I'm down to "only" the Fridge Kegerator and five taps. 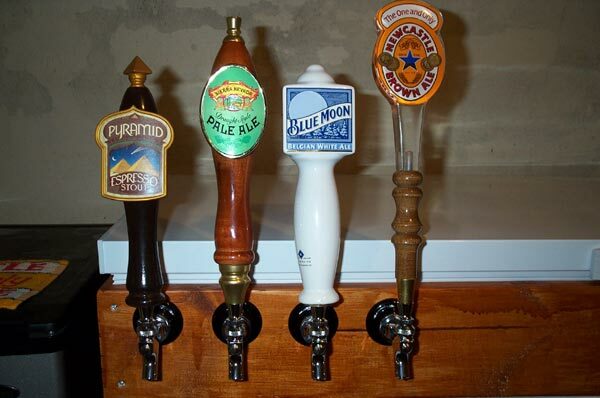 Nine beers on tap was just a bit too much now that we're having less people over to the house. 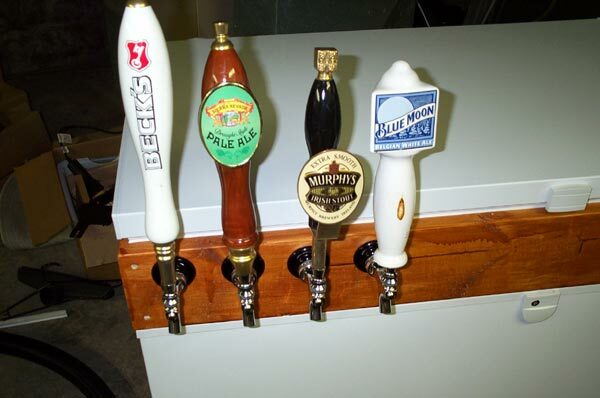 After building a Sanyo Kegerator and getting a lot of use out of it, I realized that I needed a wider variety of beer on tap. 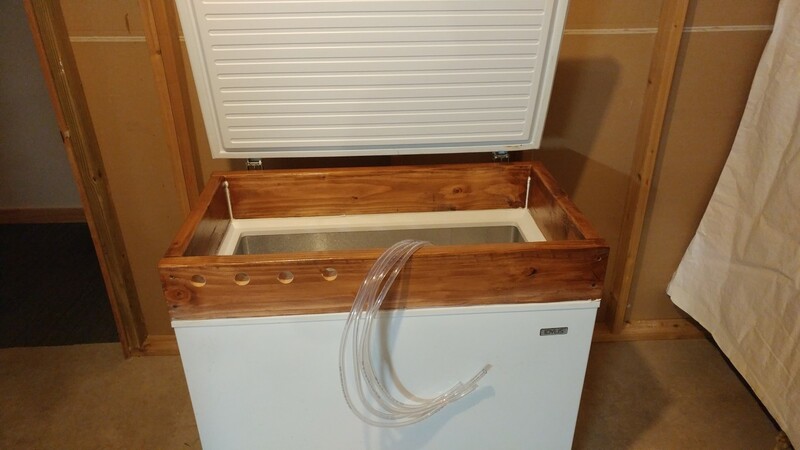 I did a little research on the Northern Brewer forum as well as some Google searches to find examples of what I was looking to build. 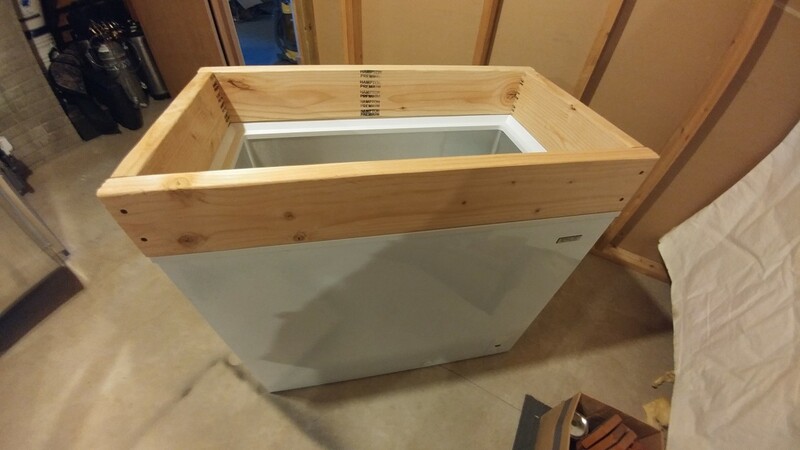 I ended up getting a 7.0 cubic foot GE chest freezer from Sam's Club for $177 plus tax that would fit 4 corny kegs comfortably. 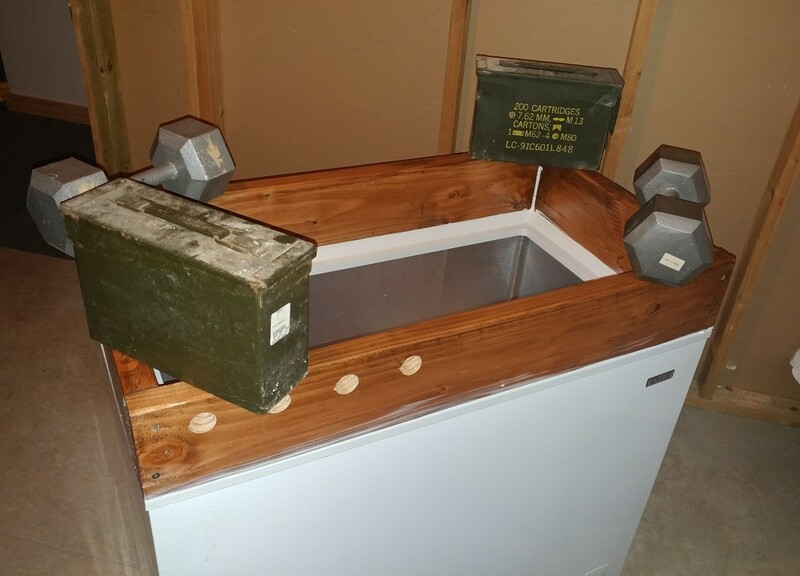 If you are unsure how many kegs a particular model of chest freezer will hold, I suggest you make paper cut-outs of the base of your kegs and place them inside the freezer to test it out. 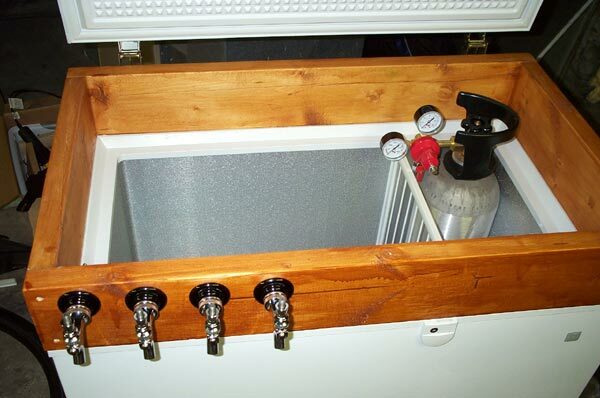 5 Way CO2 Distributor, 5/16"
After unpacking the chest freezer, I removed the lid and measured the top so I could build a wooden collar to mount my taps through. 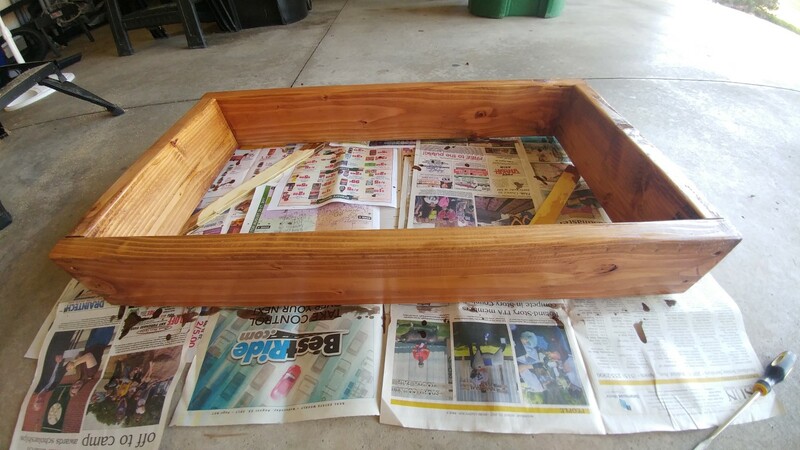 I decided that I would use 2”x6” pine to build my collar. My first attempt at building a collar didn’t work out so well. I tried using 45 degree miter cuts to give the collar a cleaner look, but my cuts must not have been exactly 45 degrees because my collar wasn’t square. After wasting a night messing with that, I went back to Lowe’s and had them cut the wood square for me so I wouldn’t have to mess with it at home. When I got home, I realized that the kid at Lowe’s cut two of my boards too short, so I made another trip across town to get the right sized wood. 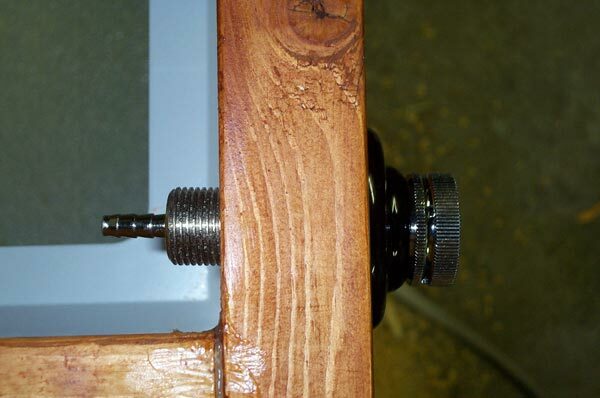 I held the wood together with miter clamps and used two 2.5 inch screws on each joint to hold everything together. 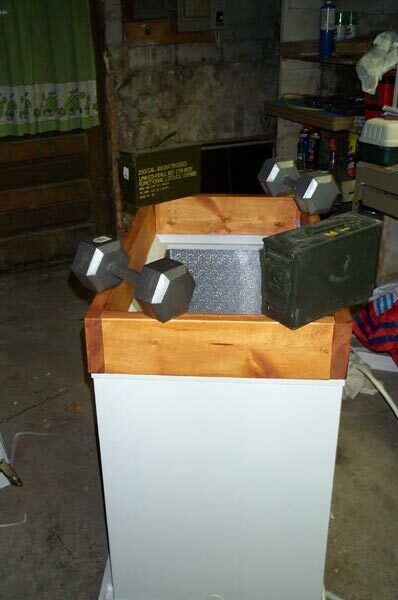 I probably should have used some wood glue in between each piece, but I didn’t. 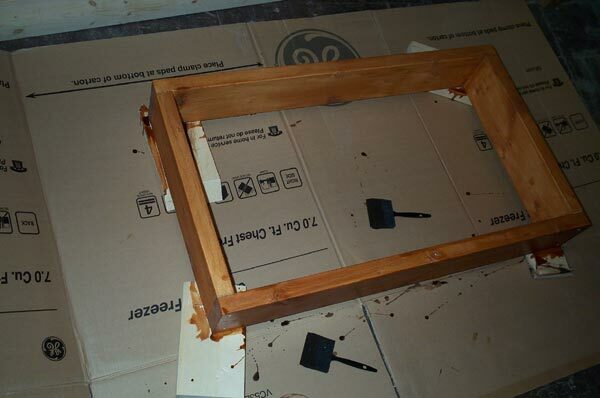 I did a little finishing sanding and rounded the edges of the collar in order to get it ready to stain. 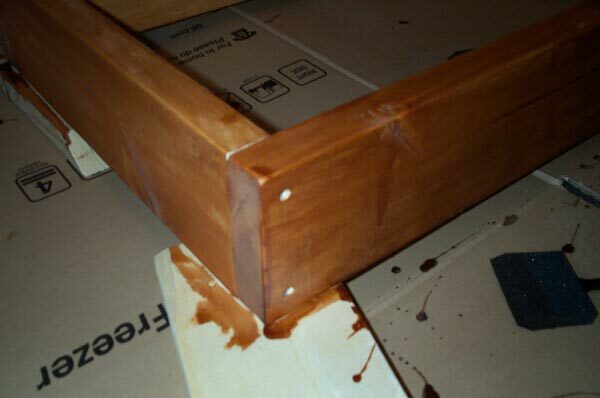 The stain I used supposedly had polyurethane in it so it was a one coat type of thing, but I ended up putting on two coats just to be safe. Here are some pictures of the collar as it was drying. After the collar had dried overnight, I put it on top of the freezer to make sure it was square. 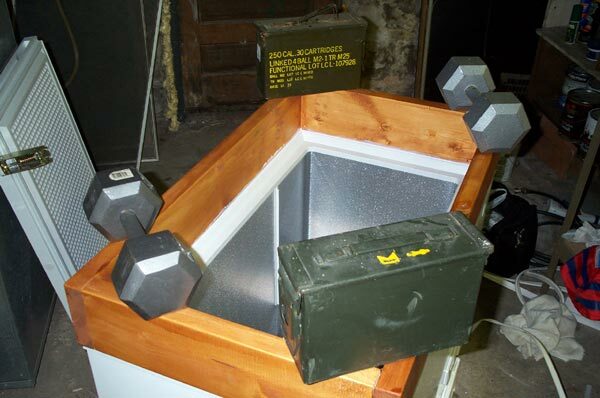 Once this was done, I laid down a thick bead of silicone all the way around the freezer and put the collar on top of it and weighted it down with some dumbbells and ammo containers. To ensure a tight seal and good insulation, I used silicone to seal up all the seams on my collar and also where the collar met the freezer. 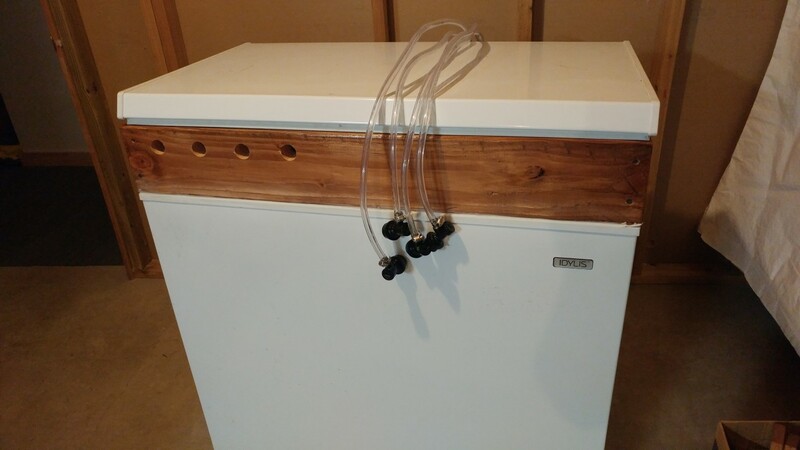 Since some people on the Northern Brewer forum stated they had rust issues in the metal seams of the freezer, I also sealed up the bottom of the freezer to prevent this from happening. 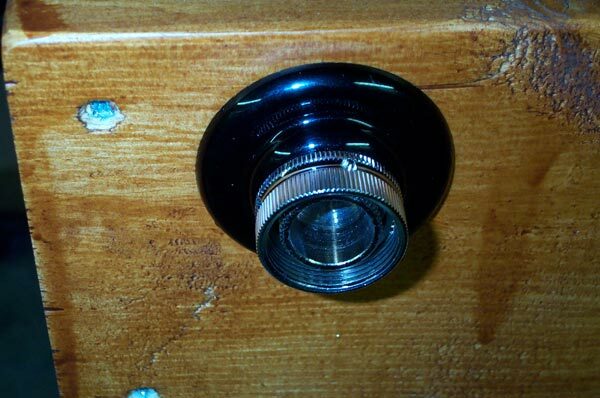 Once the silicone had dried overnight, I positioned the lid on the collar and screwed in the hinges using 1” wood screws. Here are a few pictures of what it looked like. 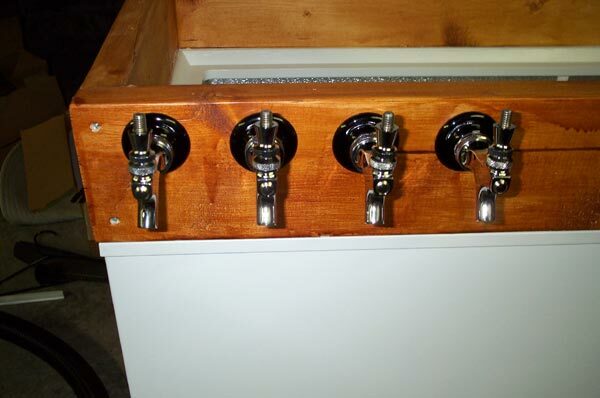 Now that the freezer was starting to look more like what I was aiming for, I figured I’d better get the taps mounted. 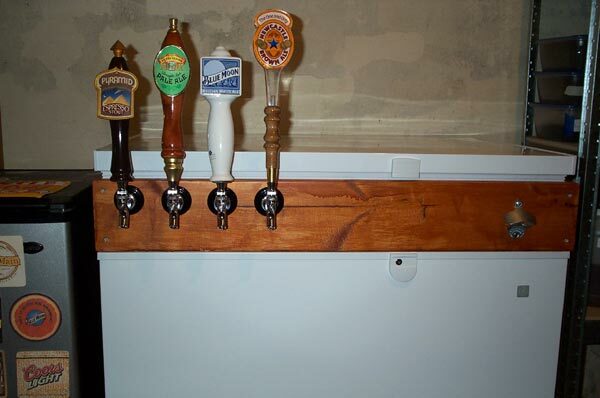 I decided to drill my holes towards the top of the 2x6 so I wouldn’t have to bend over as much when I was pouring a pint. I may have to build a wooden base to rise up the freezer for better access later. 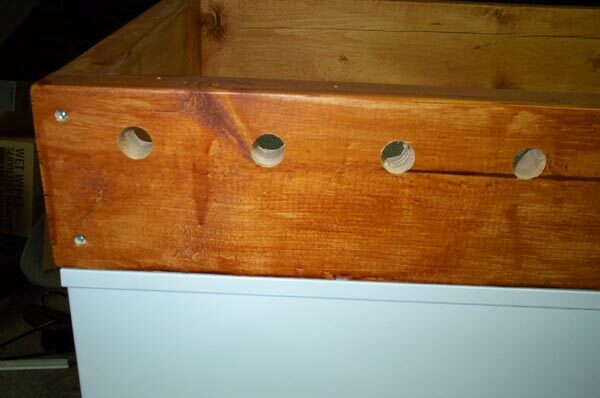 I used a 7/8” drill bit to make the holes through the collar and that provided a very snug fit against the shanks. 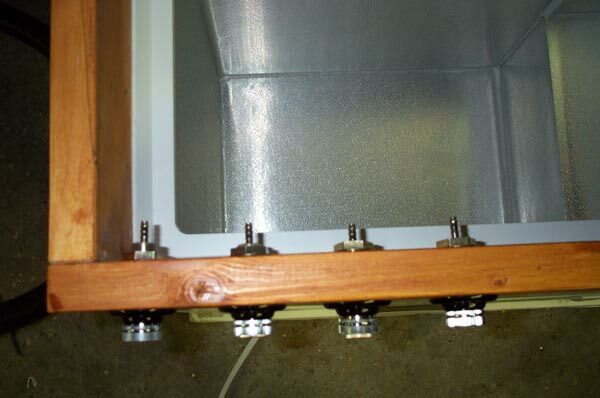 After measuring twice and drilling the holes, I inserted the 3” shanks and attached the faucets. If I were to go it again, I would have purchased 4” shanks instead so I would have a little more working room. 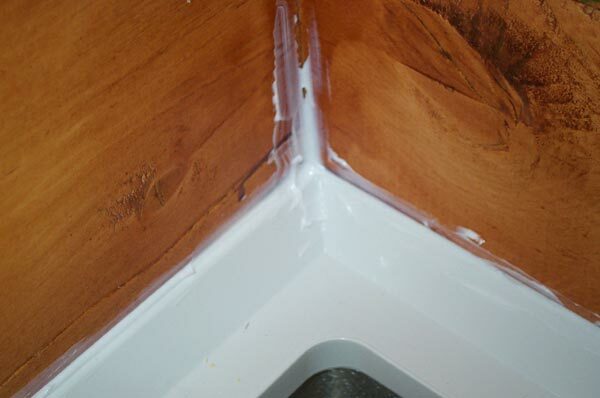 With my 3” shanks, I can’t build an overhanging collar like others have done to provide a more stable collar. 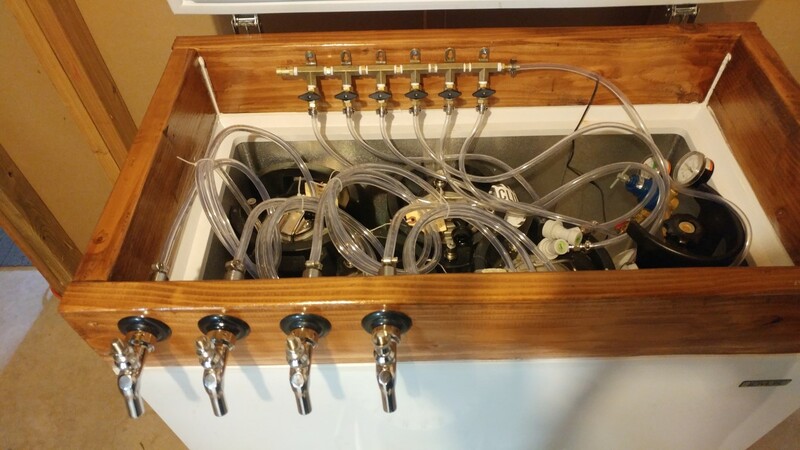 I took this opportunity to put some tap handles on the faucets and snap some shots of what the finished project would look like. 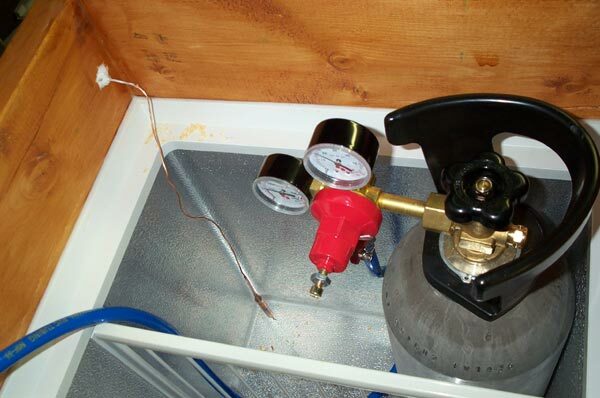 Next came the gas setup. 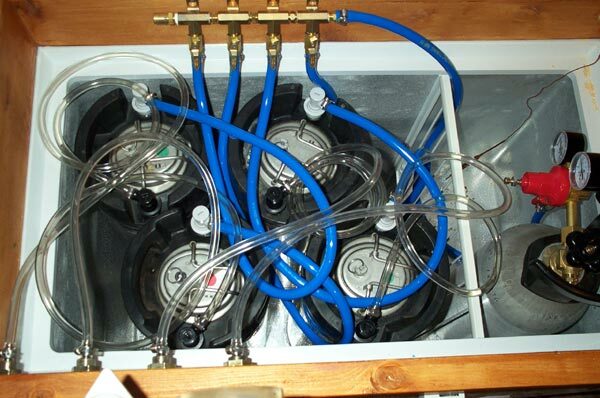 I used a 4-way gas manifold from MoreBeer since I was planning on using 4 kegs. I would have purchased a 5-way but they didn’t have one. 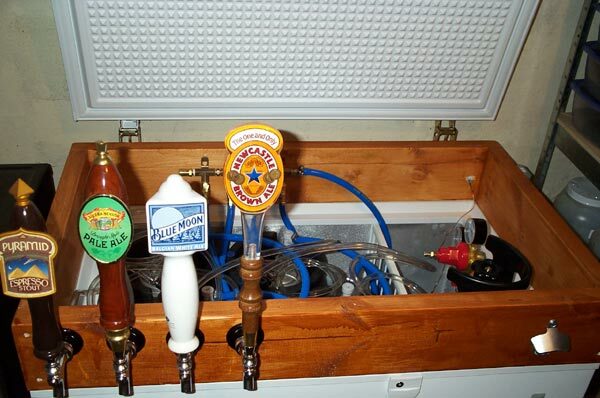 An extra CO2 line is always handy for quick keg carbonation or running cleaning solution through your lines. 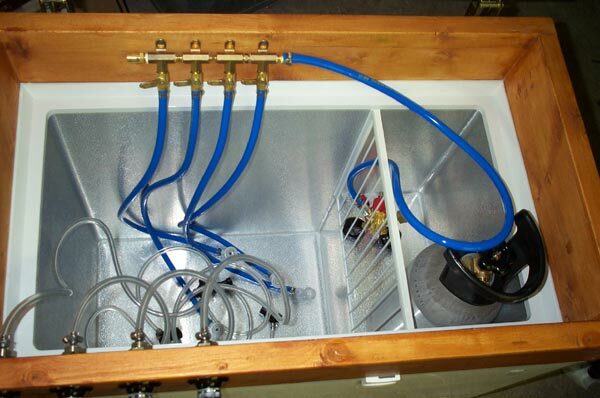 For my gas lines, I used 5/16” blue tubing from The Beverage Factory. 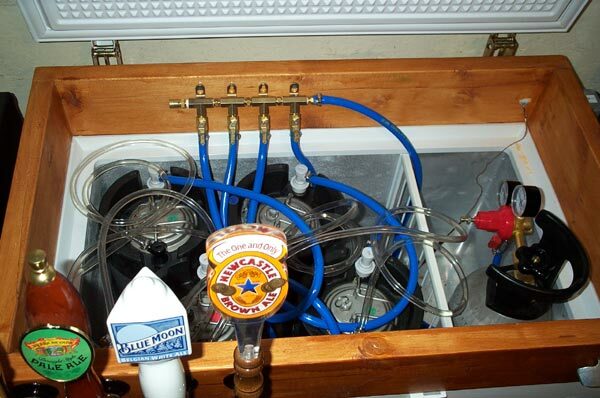 I figured that 4’ of tubing for each keg would be plenty, so that’s what I cut them to. 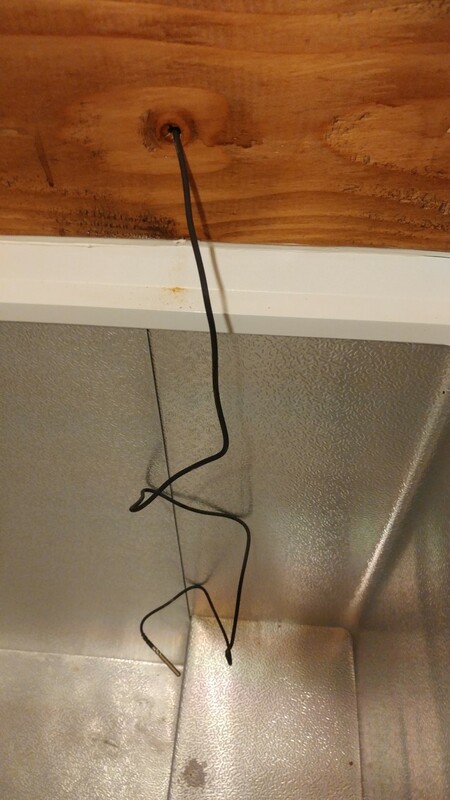 One “issue” I ran into with the tubing was that the quick disconnects were ¼” and the tubing was 5/16”. 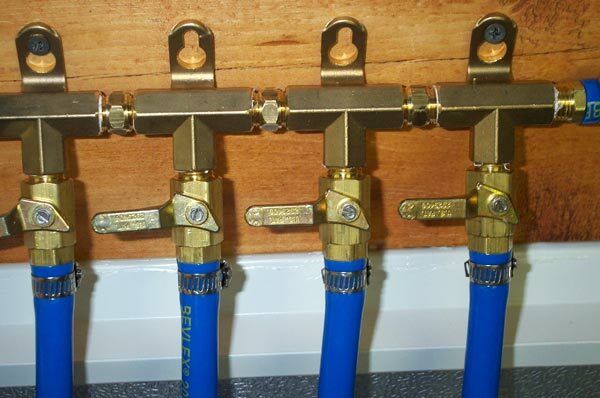 The hose clamps I purchased from Menards weren’t the best quality, and when I tried tightening them down hard, they would slip. I ended up using some clamps that I had purchased from Lowe’s on the ¼” quick disconnect barbs. 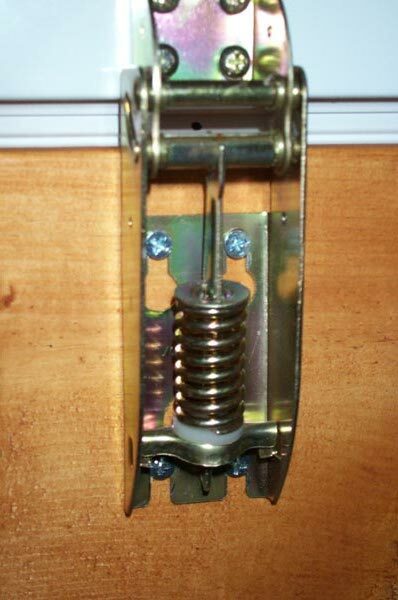 These clamps had smaller notches in the metal so they tightened down without any problems. 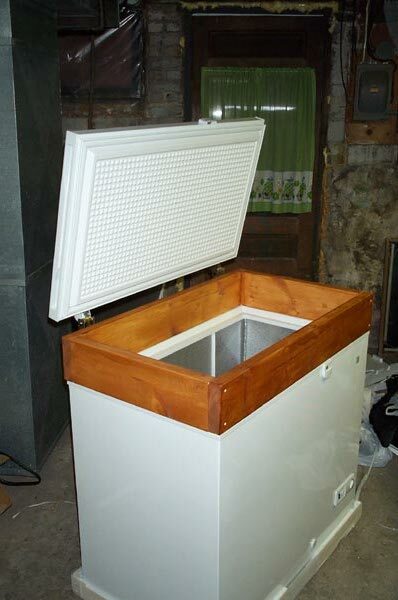 Another positive for bulidng a collar was that I could fit my 10lb CO2 tank inside the freezer without a problem. 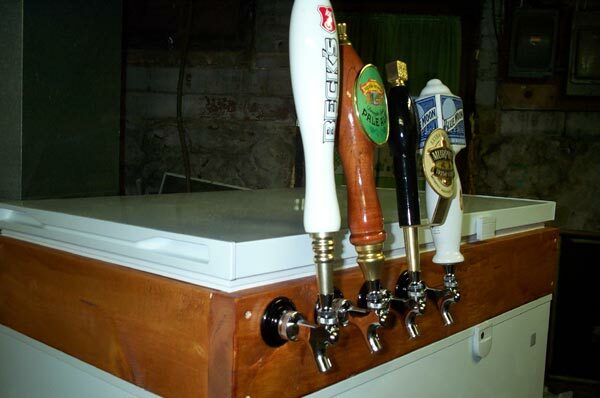 After the gas lines were installed, I attached the beer line to my shank barbs. 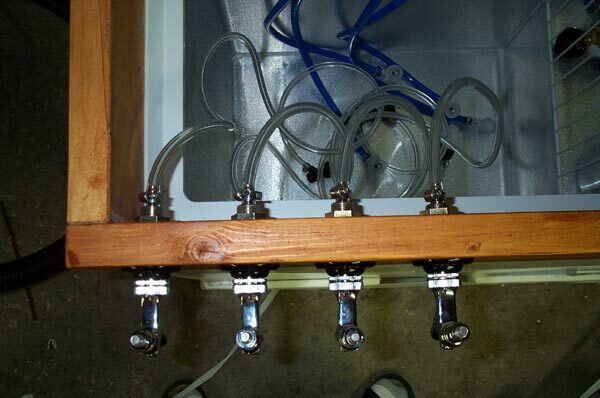 The beer tubing was 3/16” inner diameter, and the barbs were ¼” which made for a very tight fit. I found that soaking the end of the tubing in hot water made it much easier to put on the barbs. 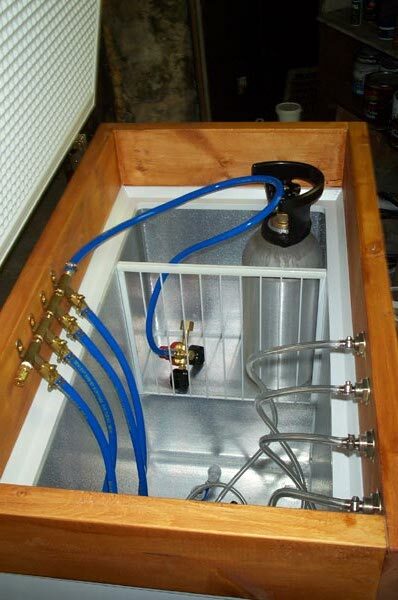 I used 5 feet of tubing for each tap and plan on setting the CO2 at 10-12psi. This makes for a balanced system. 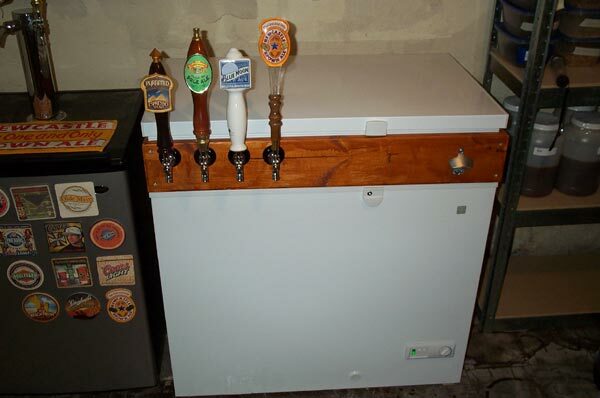 Since I didn’t want my beer to freeze inside the freezer, it was then time to install the temperature controller. After measuring the distance between the mounting holes on the back of the controller, I used 4 screws to attach the controller to the collar. 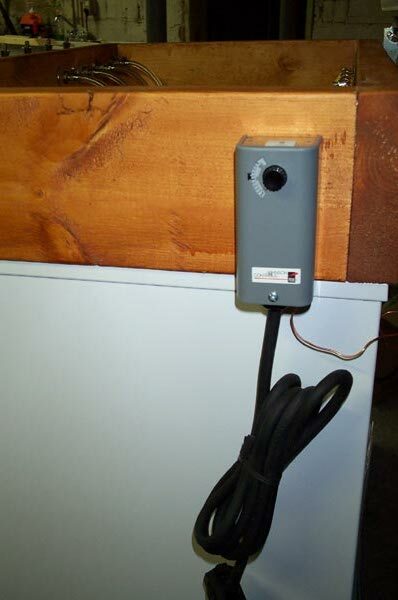 I then drilled a hole in the back of the freezer just big enough for the probe to fit inside the freezer. 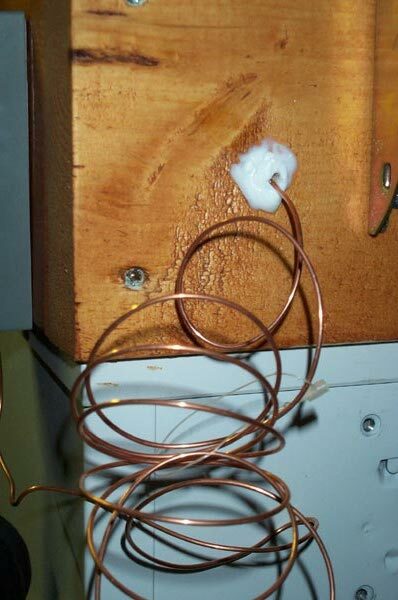 You want the probe to be suspended rather than be touching the metal sides of the freezer. 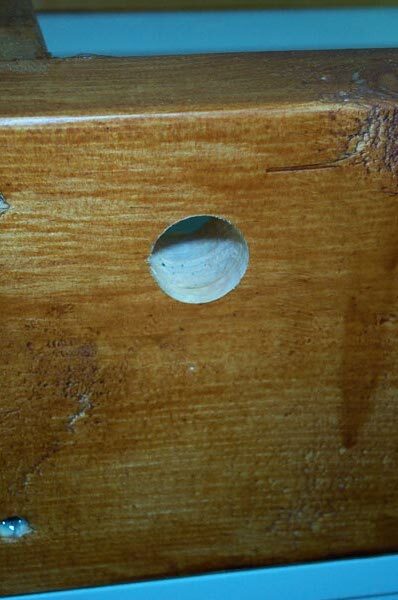 Once I had the probe positioned, I used a good amount of silicone to seal up the hole. 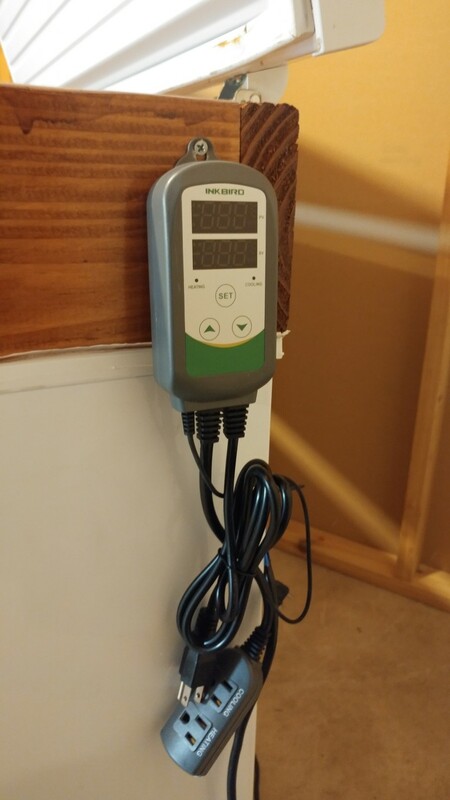 Now that everything had been installed, I moved the kegerator to its final location and set the temperature controller to 38 degrees. I plugged in the power and the compressor turned on. The freezer cooled down very quickly and seemed to be at the right temperature. 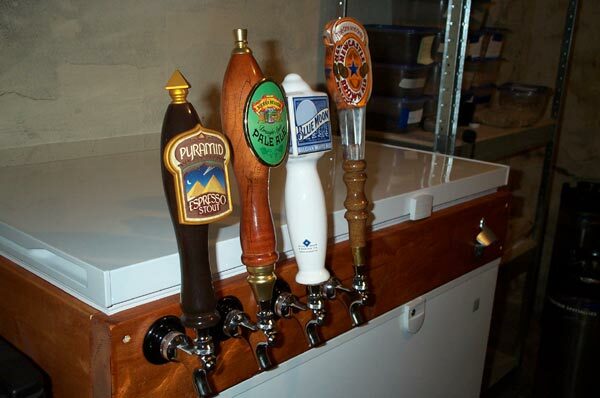 I already had 5 kegs waiting to go in the freezer, so I picked out 4 to be the christening beers. 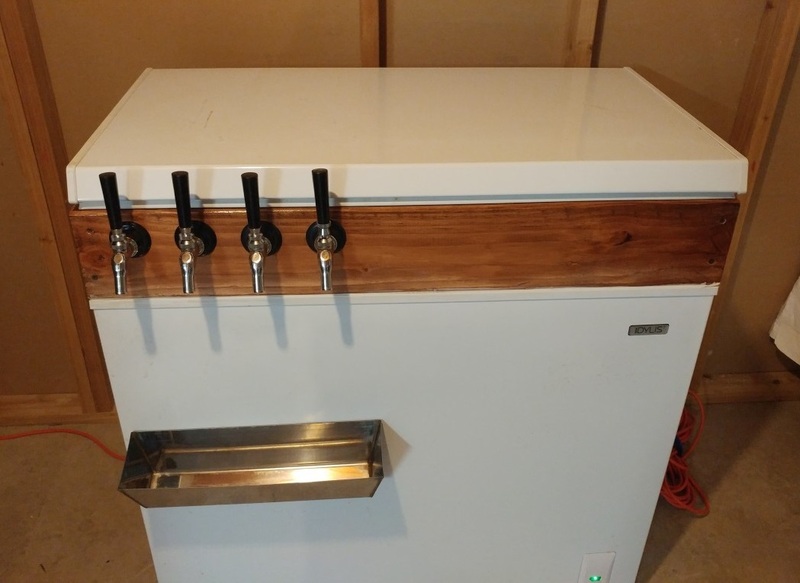 My Goldings Stout, Winter Warmer, Belgian Strong Dark Ale, and Brown Ale all went into the kegerator and I hooked up the CO2. 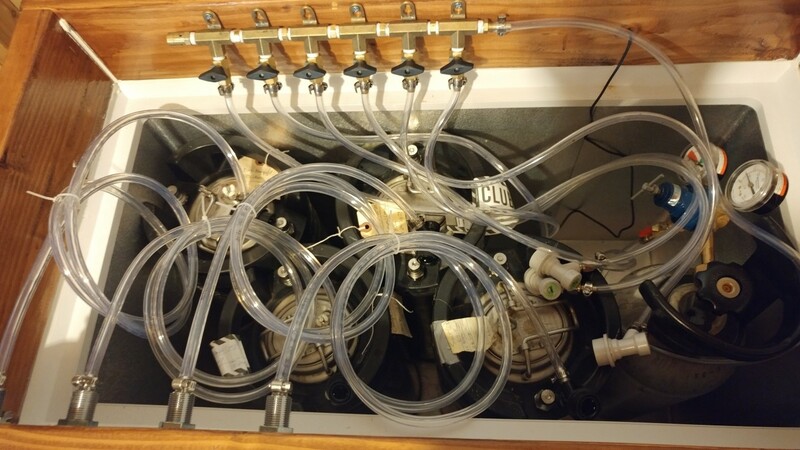 I mixed up half a keg of Idophor sanitizing solution and ran it through all the beer lines so they would be ready to go. Now all I have to do is wait.